In mid-August, China shocked markets by devaluing the yuan. 1 day, 1 week, and 1 month. In the grand scheme of things, China’s mid-August currency devaluation spree was a drop in the bucket. Since the Financial Crisis, countries have routinely printed money, kept rates pegged artificially low, and found other ways to get temporary competitive advantages with cheaper currency. While the People’s Bank of China has made some questionable interventions, China’s currency itself has been pegged to the US dollar officially or unofficially since its early history. With the US dollar climbing wildly against most global currencies since mid-2014, the yuan climbed along with it. China’s currency appreciated against all other major Asian currencies, which erased the country’s manufacturing cost advantage and trade surplus. In retrospect, it is almost surprising that they kept the reference rate where it was for this long. The strong reaction from markets and media was more from the angle that even slightest movement made by China can create a ripple effect on fragile global markets. China, for a better lack of an analogy, is a bull in a china shop. Its economy and currency are seen as important bellwethers and when the PBOC makes an announcement, people listen. That’s why in mid-summer, markets got volatile in a hurry. China devalued its currency by 1.9% on August 11 and made some smaller changes since then. The country also announced adjustments to how it would calculate its onshore reference rate moving forward. Today’s infographic looks at the reaction in currency markets in three timeframes after the event: 24 hours, one week, and one month after. Some currencies, like the euro, appreciated against the Chinese Renminbi right away and maintained that momentum. The euro went up 2.06% in the first day, and then continued to appreciate to 5.73% by the end of 30 days. Others swung back and forth wildly: at first the South African rand was up 0.71%, but then it ended as the biggest loser against the yuan at -4.24% over the course of a month. Despite the mixed reaction from different currency markets, the reason China did this was clear. The country wanted to promote convergence in its onshore and offshore rates, and it has also been trying to woo the IMF for some time to be included in the IMF’s basket of reserve currencies called Special Drawing Rights. The latter move is a part of China’s posturing to eventually better internationalize the yuan. As a side benefit of the devaluation, China also gets temporary relief in promoting exports at a cheaper price – though this will only last until the next country takes action in the game of currency war hot potato. Earlier today, Macquarie released a must-read report titled "Further deterioration in China’s corporate debt coverage", in which the Australian bank looks at the Chinese corporate debt bubble (a topic familiar to our readers since 2012) however not in terms of net leverage, or debt/free cash flow, but bottom-up, in terms of corporate interest coverage, or rather the inverse: the ratio of interest expense to operating profit. With good reason, Macquarie focuses on the number of companies with "uncovered debt", or those which can't even cover a full year of interest expense with profit. The report's centerprice chart is impressive. It looks at the bond prospectuses of 780 companies and finds that there is about CNY5 trillion in total debt, mostly spread among Mining, Smelting & Material and Infrastructure companies, which belongs to companies that have a Interest/EBIT ratio > 100%, or as western credit analysts would write it, have an EBIT/Interest < 1.0x. As Macquarie notes, looking at the entire universe of CNY22 trillion in corporate debt, the "percentage of EBIT-uncovered debt went up from 19.9% in 2013 to 23.6% last year, and the percentage of EBITDA-uncovered debt up from 5.3% to 7%. Therefore, there has been a further deterioration in financial soundness among our sample." To be sure, both the size (the gargantuan CNY22 trillion) and the deteriorating quality (the surge in "uncovered debt" companies) of cash flows, was generally known. What wasn't known were the specifics of just how severe this bubble deterioration was for the most critical for China, in the current deflationary bust, commodity sector. First, it shows the "debt-coverage" curve for commodity companies as of 2007. 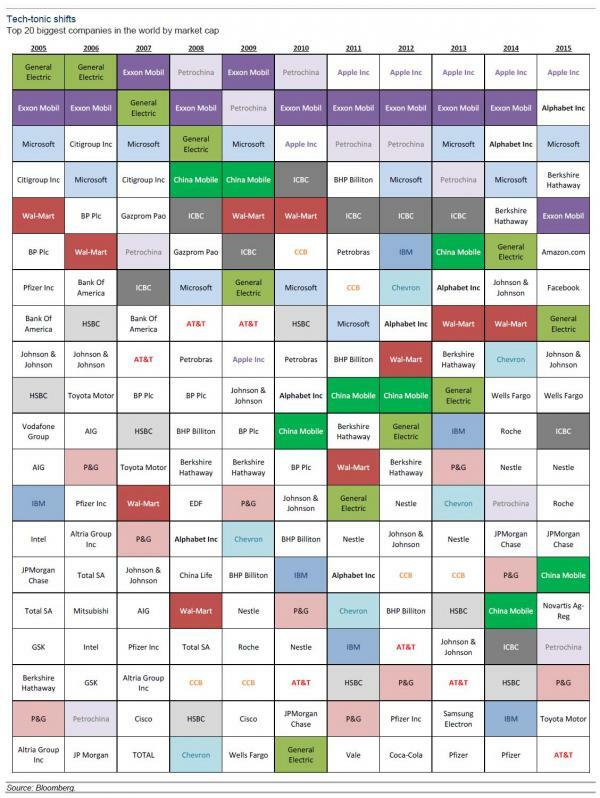 One will note that not only is there virtually no commodity sector debt to discuss, at not even CNY1 trillion in debt, but virtually every company could comfortably cover their interest expense with existing cash flow: only 4 companies - all in the cement sector - had "uncovered debt" 8 years ago. And then in 2014, everything just falls apart. Quote Macquarie, "more than half of the cumulative debt in this sector was EBIT-uncovered in 2014, and all sub-sectors have their share in the uncovered part, particularly for base metals (the big gray bar on the right stands for Chalco), coal, and steel." So are we now? Macquarie again: "Given the slumps in metal and coal prices so far this year, it’s quite likely the curve will have deteriorated further for commodity firms this year, with total debt getting better in the meantime." In other words, it is safe to assume that up to two-third of Chinese commodity companies are now at imminent danger of default, as they can't even generate the cash to pay down the interest on their debt, let alone fund repayments. 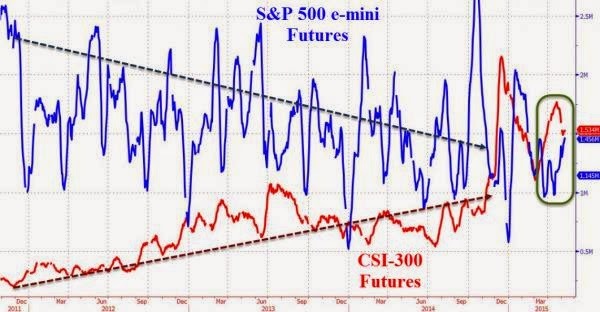 We fully expect this to be the source of the next market freakout: when the punditry turns its attention away from macro China, which has more than enough problems to begin with, and starts to focus on the cash flow devastation in China at the micro, or corporate, level. (Reuters) - Manufacturing activity in Asia's top two economic powerhouses slowed further in April, a disappointing outcome that calls for yet more stimulus and puts pressure on the United States and Europe to do more of the heavy lifting to drive global growth. 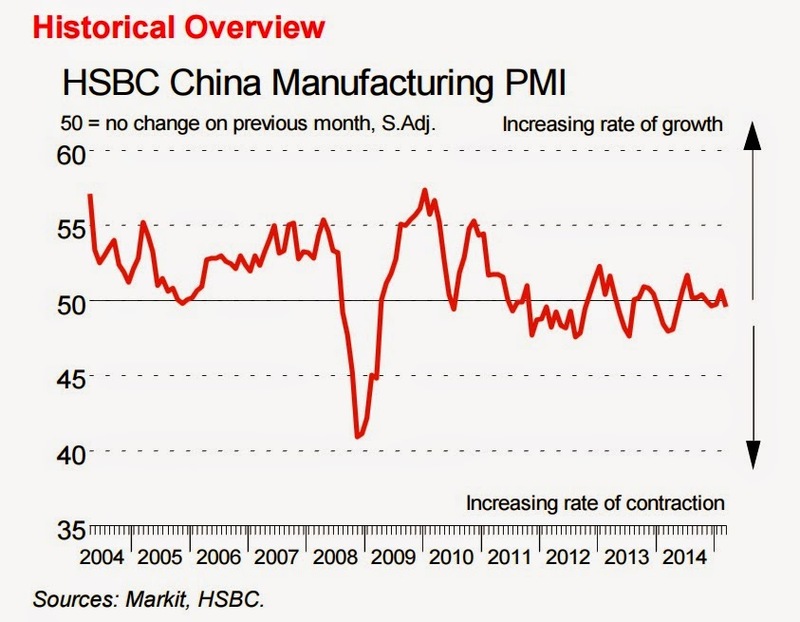 The flash HSBC/Markit Purchasing Managers' Index (PMI) for China fell to a one-year low of 49.2, from 49.6, pushing deeper below the 50-point level that is supposed to separate growth from contraction. "The worse-than-expected PMI suggests downside risks to China's 2015 growth outlook," analysts at Barclays wrote in a note to clients. 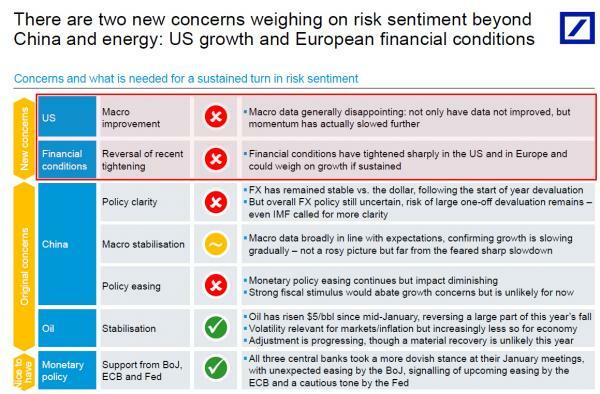 "We believe downside risks to growth and inflation are materialising given the disappointing Q1 growth rate, and maintain our below-consensus 6.8 percent growth forecast for 2015." 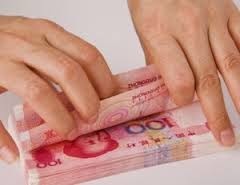 (PBOC) on Sunday cut the amount of cash that banks must hold as reserves to help spur lending. It slashed the reserve requirements by a bigger-than-expected 100 basis points (bps). "We continue to call for two more 50 bps reserve requirement ratio cuts and three more 25 bps benchmark rate cuts over the rest of the year," Nomura analysts said in a research report. Hopes of yet more stimulus have helped sparked a massive rally in the local share market. The CSI300 index <.CSI300> of the largest listed companies in Shanghai and Shenzhen has risen over 30 percent so far this year. It briefly scaled a fresh seven-year peak of 4,767.9 in the wake of the survey, but has since drifted off the high. The report was not all bad with overseas demand picking up in April and new export work rising for the first time in three months. A separate survey showed Japan's PMI slid to 49.7 from 50.3 in April as new orders continued to shrink and manufacturing production fell for the first time since July 2014. Yet the rate of decline for production was only fractional and encouragingly employment returned to growth. "Meanwhile, reports of a favourable yen/dollar rate continued to help improve price competitiveness, as companies noted a rise in new export orders for the tenth consecutive month," said Amy Brownbill, an economist at Markit. The result is unlikely to drive the Bank of Japan (BOJ) into action. The BOJ has steadfastly maintained its outlook for a recovery that will keep the economy on track to hit the central bank's 2 percent inflation goal over time. At next week's policy review, the BOJ is expected to hold off on expanding its already massive monetary stimulus but may lower its inflation forecasts. All eyes are now on PMI surveys for the euro zone, with forecasts for the Markit's flash Eurozone Composite PMI centring on a more encouraging reading of 54.4, up from 54.0. In the United States, the factory sector is expected to continue expanding in April, albeit at a slightly slower pace. The Markit's flash U.S. manufacturing PMI is seen at 55.5 versus 55.7 in March. The People’s Bank of China (PBOC) will reserve requirement ratio (RRR) by one percentage point, the central bank announced on Sunday. The monetary stimulus will boost aluminium market, but any price rally should be limited, given the poor market fundamentals, Guoxin Futures told SMM. Guoxin Futures added that power tariff cuts will weaken cost support for aluminium prices, another factor that will arrest sharp price gains. The recent rise in aluminium prices was aided by China’s pro-growth policies and hopes for more stimulus measures, rather than an improvement of market fundamentals, Hongyuan Futures told SMM. The chronic overcapacity means that this round of RRR cuts will have limited impact on aluminium prices, Hongyuan Futures added. “The monetary easing will definitely benefit copper market, and we now see copper to climb to 45,000 yuan per tonne,” chief analyst from COFCO Futures predicts. 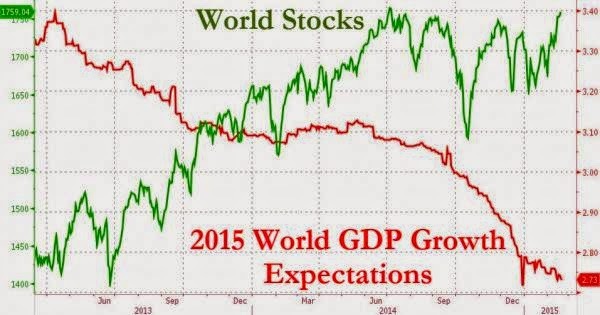 So what exactly was the Chinese stock market 'discounting'? 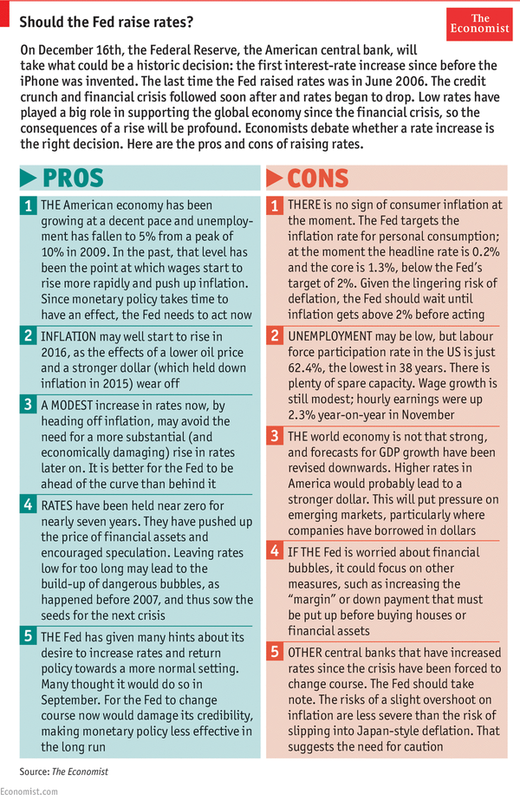 Which is odd that all the data massively missed expectations which we assume Economists were aware of the calendar? Which means Moar QE... Which means stocks limit up? China’s steel and metals markets, a barometer of the world’s second-biggest economy, are “a lot worse than you think,” according to a Bloomberg Intelligence analyst who just completed a tour of the country. What he saw: idle cranes, empty construction sites and half-finished, abandoned buildings in several cities. Conversations with executives reinforced the “gloomy” outlook. President Xi Jinping is stepping up efforts to combat pollution, further squeezing industry. And the data doesn’t look so hot especially after last month’s contraction territory PMI print and collapsing rail freight number. Then there’s rising NPLs which are prompting the country’s largest banks to slash payouts as loans to manufacturers sour in the face of the very same economic transformation cited by Bloomberg. 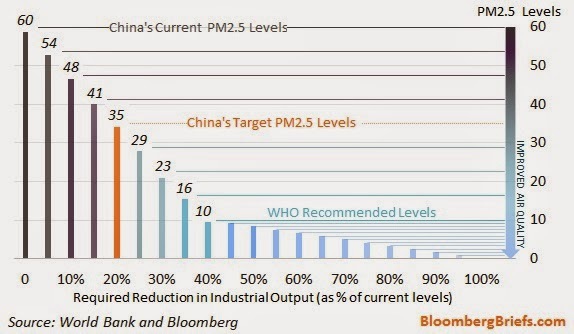 Finally, China has a small smog problem and while Beijing is apparently trying to export some of this to places that can use a little more pollution (like the rainforest), some estimates suggest that cleaning up the country’s air will come at the price of a 40% decline in industrial production. We have made fundamental changes to our demand analysis for iron ore. Given sharply weaker regional steel prices, we now assume a reduction in Chinese steel exports over the period to end-2018. Given a weak domestic backdrop for steel consumption, this results in steel production declines over the next three years. 2016 is likely to be even tougher year than 2015 for prices as China steel production declines persist (forecast down 0.6%), Roy Hill mine comes to market, BHP adds 25Mtpa, and Rio Tinto continues its ramp up towards +350Mtpa output. In 2016, we expect the most marginal tonnes will have exited the previous year, so the reduction of China domestic tonnes and the retracement of "Other" seaborne tonnes will have slowed. Another period with aggressive pricing will be needed to clean out the new marginal tonnes. We forecast a price of $45/t CFR for the first two quarters next year. Our China colleagues expect steel growth rates to be negative. 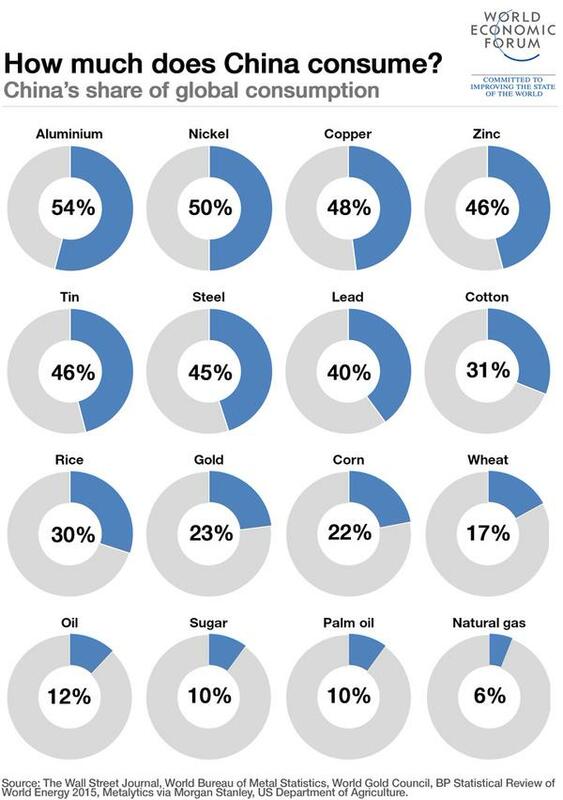 Figure 10 shows how far China's domestic steel consumption has contracted from peak levels of 12 months ago. Can you say "hard landing"? The Global Death Cross Just Got "Deathier"
When does the foundation of faith in central planners start to break? China's central bank on Wednesday decided to lower the reserve requirement ratio (RRR), the minimum level of reserve banks must hold, by 50 basis points from Feb. 5. 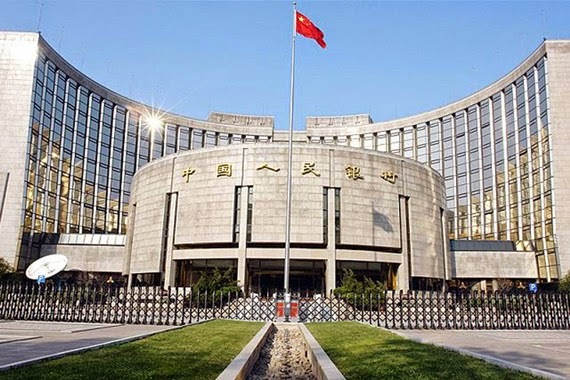 The People's Bank of China (PBOC) also increased support to some target areas, cutting the RRR by an extra 50 basis points for certain commercial banks engaged in proportionate lending to small firms, the farming sector and major water projects, said the central bank's statement. The Agricultural Development Bank of China, the sole policy lender for agriculture, gets an RRR reduction of 4 percentage points. Currently, big banks must hold 20 percent of their deposits in reserve, while the ratio for small and medium-sized banks is 16.5 percent. 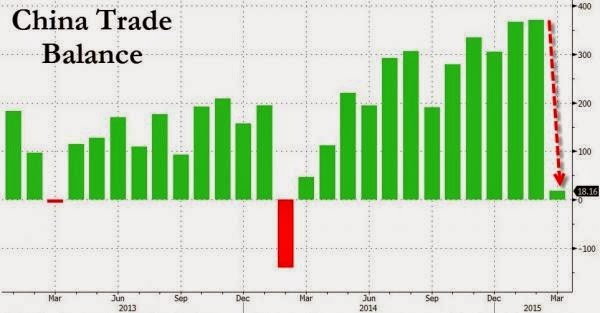 The move came days after the purchasing managers' index, a main gauge of manufacturing activity, fell below the 50-point mark for the first time since October 2012, a sign of a weakening economy. 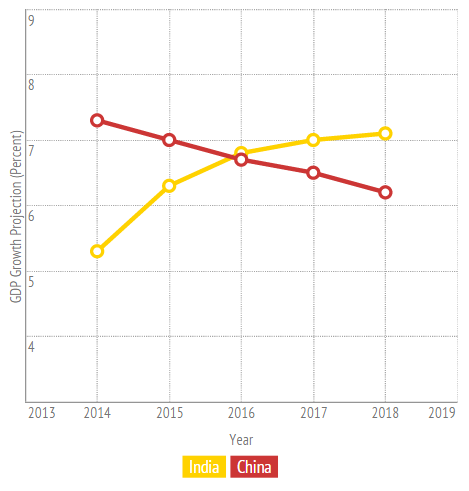 The world's second largest economy grew at the slowest rate for 24 years in 2014. The PBOC said that it would "continue a prudent monetary policy, striking a balance between being tight and loose, guiding monetary credit and private financing to grow steadily and moderately, promoting a healthy and steady economy." 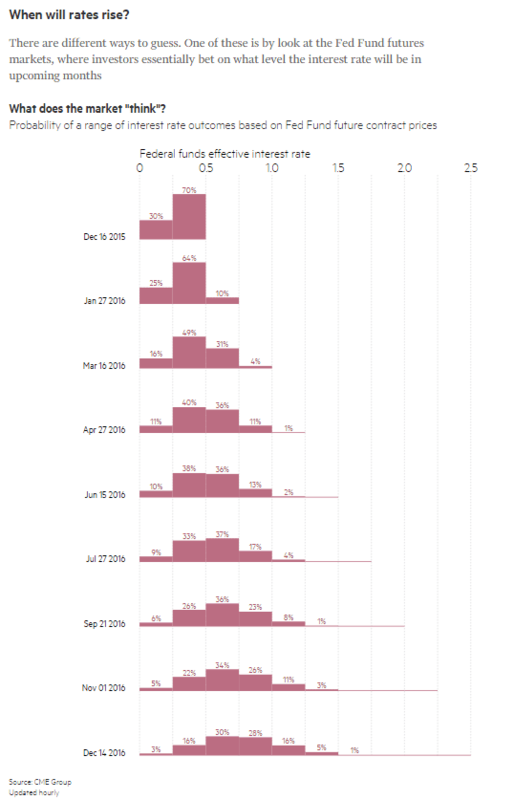 The central bank cut benchmark interest rates for the first time in more than two years in November 2014. Just 13 short months ago - two months before then President Yanukovich was ousted - Russia lent Ukraine $3 billion (by buying their Eurobonds). As Reuters reports, the terms of that loan included a condition that Ukraine's total state debt should not exceed 60% of its GDP. As of last month, based on Moody's estimates, Ukraine has violated that condition with a debt-to-GDP of 72% (and will likely rise to 85% of GDP in 2015).. and so, according to Russian finance minister Anton Siluanov, "Russia has the right to demand early return of this loan." With European aid 'contingent on major reforms' and possibly taking up to 1 year, this leaves the good old IMF (i.e. the US and European taxpayer) to bridge Ukraine's 'gap' and ironically bailout Russia. Ukraine has violated the terms of a $3 billion Russian loan but Moscow has not yet decided whether to demand early repayment, Russian Finance Minister Anton Siluanov was quoted on Saturday as saying. Last month, rating agency Moody's estimated that Ukraine's debt amounted to 72 percent of GDP in 2014 and would rise to 83 percent in 2015. It also said "the risk of default is rising". The European Union is considering a further 1.8 billion euros ($2.1 billion) in aid to Ukraine to help the former Soviet republic overhaul its economy, which has been ravaged by a separatist conflict in its easternmost regions. The European Commission, the EU executive, said the fresh loans, on top of $17 billion already pledged in the International Monetary Fund-led rescue of the troubled country, werecontingent on the Ukrainian government pushing through economic reform measures and fighting corruption. Disbursement of the aid, which must still be approved by the European Parliament and the EU’s 28 governments, will depend on Ukraine’s adherence to the conditions of the IMF program, which include fiscal consolidation, changes in the energy and banking industries, and other measures, the commission said. This would be the EU’s third package of loans to Ukraine, following two totaling 1.6 billion euros approved last year. A final portion of 250 million euros from the earlier aid is due to be given within the first months of this year, according to the commission. So - while Russia 'suffers' under the thumb of plunging oil prices and a tumbling currency crisis, a simple decision to push Ukraine into early repayment could leave Europe - having paid out their entire Ukraine bailout to Russia - asking for moar help from the IMF (i.e. The US Taxpayer) to keep the 'crucial' nation state of Ukraine from default. It seems like it was only yesterday when we reported that, in yet another sleight of hand for the US Treasury and Social Security Administration, US debt rose by $32 billion on the last day of November sending total US debt above $18 trillion for the first time ever. 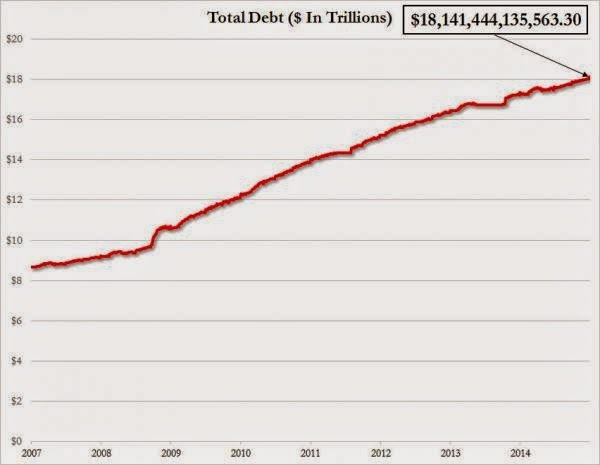 As we further noted, it also meant "that total US debt has increased by 70% under Obama, from $10.625 trillion on January 21, 2009 to $18.005 trillion most recently." Fast forward to today when we are happy to report that according to the US Treasury, America's debt-funded spending spree, while supposedly slowing down if looking at the declining monthly budget deficit report, never actually has. 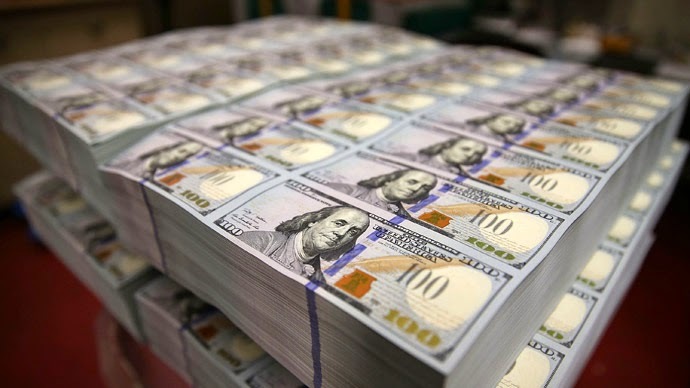 As of the last day of 2014, total US debt soared by $98 billion in one day (driven again by Social Security debt surging on the last day of the month to a record $5.117 trillion), and closing off 2014 with a new all time high total of $18.141 trillion in Federal debt - an increase of $136 billion in the month of December and $790 billion for all of 2014. What is more interesting is that the top 2 most talked items were defined as such by Liberal Activists, where the topic dearest to Conseratives' hearts, Guns, was only 8th in the combined ranking. Which begs the question: while the media may or may not have a liberal bias, it does appear that the main talking points in at least media distribution outlet are set by those a liberal bent. Maybe simply because they have far more time to retweet and engage in meaningless Internet debate? Meaningless internet speculation aside, here is how 2014 progressed through the eyes of Twitter users. If you are wondering what triggered the PBOC to pull the punchbowl of leveraged collateral away from the 'wealth-creating' stock market exuberance in China... wonder no more. 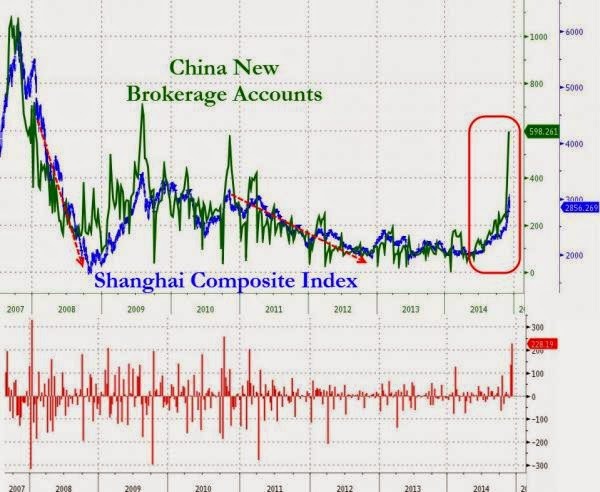 The last 2 weeks saw the biggest surge in new Chinese brokerage accounts ever, with this week alone the highest since October 2010 and January 2008 with a stunning 228,000 new accounts opened. On both prior occasions of such a maniacal surge in speculative accounts, the Shanghai Composite made a significant top and fell dramatically in the ensuing months. How oddly dis-similar the PBOC is to the Fed!! Instead of encouraging open leveraged speculation, the central bank of China appears more risk averse, recognizing the potential medium-term disastrous consequences from such boom-bust moves (and likely has no cheer-leading CNBC channel to take care of). 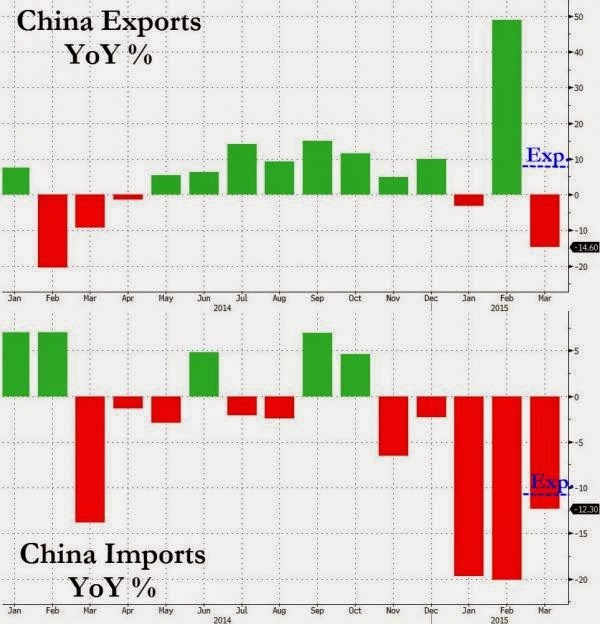 Chinese imports and exports dramatically missed expectations this evening but it is imports that was thereal driver that pushed the trade surplus to $54.47 billion (higher than the $43.95 billion expected) record highs. Exports rose just 4.7% YoY (against expectations of an 8.0% rise and previous 11.6% rise) for the slowest growth since April. Imports utterly collapsed; plunging 6.7% YoY (against expectations of a 3.8% rise and prior 4.6% YoY rise). This is the biggest drop since March and 4th largest plunge since Aug 2009. Of course, in any real world this means 'the rest of the world' should be suffering from huge drops in exports... but we are sure, by the magic of fradulent invoicing that will not be the case. The PBOC may have got a glimpse and fixed CNY at its strongest since March and highest premium to the market since August.